To bring you up to speed, the North Side neighborhood in which I own a shanty has been renamed. It was called 'Perryhilltop' but I renamed it, after me. The new name for 'Perryhilltop' is 'Brusistan,' a newly christened third world American slum. I am a proud and productive resident of Brusistan. 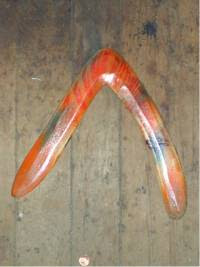 As far as I know, one of the few manufactured goods made here in Brusistan is boomerangs. All shapes and sizes. Made of durable industry standard materials, each hand made. Thus far I have manufactured some of the best rangs any rollicking rowdy individual could love or dream over. My boomerangs, properly thrown in good weather conditions, return. The industry standard 'rangs, made of five ply cabinet grade baltic birch plywood, perform a diverse family of arcs, runs, sweeps and encirclements. They do the tricks that boomerang experts world wide recognize as throughbred horse-like elegance in motion. By goodness, they describe a ramping tear-drop shaped flight in the air above a good sized sports field. The first arc travels near eye level away from ground zero, then takes a short sharp run up and around, most of the way back to the thrower. But not entirely. A great boomerang will slow down on the return sweep. Just over it's tender's head it will go into small circles, like a falling maple seed in nature's helicopter configuration, gyrating gently to fertile soil. A world class fine 'rang will lower itself down to you, spinning and circling, which is how these fine sporting devices say to you, "Catch me, catch me. Take me you, fool." A champion boomerang is like a champion horse. It looks great standing still, and it looks great in motion. It has a pleasing disposition. It has a proper sense of self and community. Unlike some people and places I could mention.